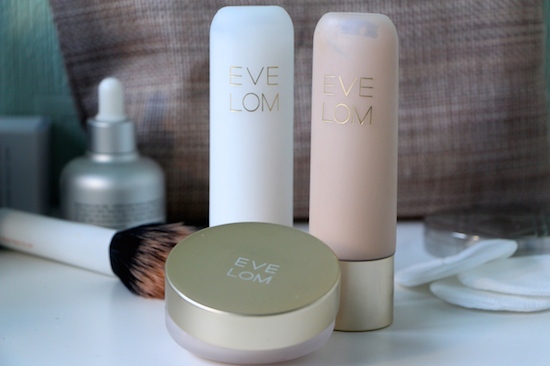 A rather belated review, I’m afraid; I had a bit of a shade mix-up with the Eve Lom products when they were first launched and then they got a little overlooked for a while, partly because I wasn’t overly wowed by the product that I tried first (spoiler alert!) but mostly because my schedule went haywire and I simply couldn’t get around to doing an in-depth test. But now I have had a good play and I think that you may be surprised at my verdict – the results certainly surprised me! I was positive, before even opening the packaging, that my favourite products from the range would be the Flawless Radiance Primer and the Radiance Perfected Tinted Moisturiser. These are the types of high-end, luxurious, “my-skin-but-better” products that I reach for time and time again; makeup that gives a flawless yet natural-looking complexion. Cosmetics that do a great job but are barely noticeable on the skin. I have drawers filled with these skin enhancing, glow-producing creams and lotions – the “barely-there” finish is absolutely my default look. Interestingly, though, I wasn’t initially bowled over by this skin-enhancing duo. There wasn’t anything particularly wrong with them, they just didn’t seem to quite live up to the hype. The Radiance Primer gave a good, subtle glow, the finish was silky smooth and it felt incredibly hydrating, like a powerful-but-light moisturiser (the texture of the Elemental Emulsion from Omorovicza very vaguely comes to mind) but despite the fresh and comfortable feeling, it didn’t really stun me with any kind of mega-watt luminosity. I absolutely love-love-love the Mineral Powder Foundation. Me! I know! Shunner of the powdery bases! I was prepared to just give the Eve Lom version a cursory swish-swash with a kabuki brush, such is my general distaste for mineral foundations, but I am so very glad that I gave this a thorough trial. I’ve now been using it as a kind of “perfecting powder veil top coat” nearly every day for the past fortnight or so. 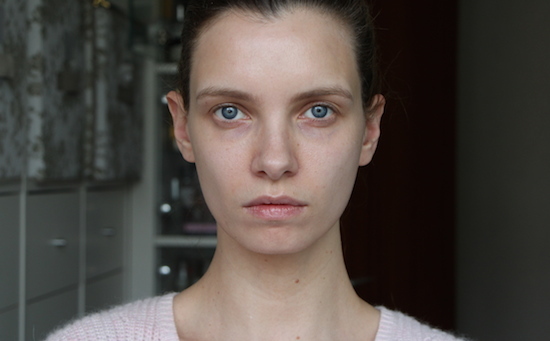 It is really just the most radiant, glowy, lit-from-within powder foundation that I’ve ever used. It’s a bit like the Ambient Lighting powder from Hourglass, (though far, far more subtle, thank God, otherwise I’d look like a shiny android), in that it doesn’t seem to have any obvious shimmer but neither does it absorb light and make the skin flat. It just seems to kind of process the light and multiply it and send it back on out again with a high-intensity kick. Absolutely brilliant. I just whisk a bit over the top of my CC cream or tinted moisturiser or (less frequently) I use on bare skin and build it up to my required coverage. I think that it’s best buffed in as a finishing touch, though – it seems to just hold everything in place and bring it all together. Top stuff. It does cost £45, but I only use about enough each time to fill a gnat’s boots, so I’m anticipating this lasting a good while. 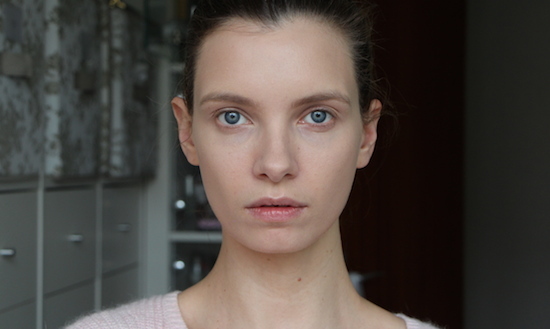 A surprise verdict, then – the Mineral Powder Foundation comes out on top. As a visual aid, I’ve popped in a couple of photos above: one with just primer, and then primer, tinted moisturiser and powder foundation. I’m sorry, I forgot to pause and take a snap of the makeup pre-foundation, but you can see it all in action in my latest Youtube video. It’ll be embedded into tomorrow’s post, but you can watch it here if that’s too long to wait! Eve Lom Makeup is available at SpaceNK – I used Ivory 02 in both the TM and the Mineral Foundation.